Interesting story of Benchmark Capital, a Silicon Valley VC firm and their investments during the dotcom boom in the late 90s and early 00s, pre- bursting of the bubble. Conveys the atmosphere of the industry and the personalities - all very gung-ho and "American", which makes for entertaining reading. The stories and mini-case studies of individual investments are quite insightful - there are a lot of pages devoted to Ebay's development and other less successful investments (e.g. ToysRUs website).Interesting to look up what happened to most of the investee companies mentioned. Can't help but think a typical example of the dotcom mania is Webvan - the Benchmark fund put in something like USD 3m into building a very capex-intensive business, raising follow-on capital from other funds and eventually making a killing in the IPO, where this loss-making company with an unproven business model was valued at USD 100bn. Webvan went bust in 2001, was eventually sold to Amazon and according to Wikipedia got the dubious honour of being named the largest dotcom flop in history by CNET. No doubt a highly successful investment for the Benchmark LPs who cashed out in the public offering, but from the perspective of long-term value creation for the public who bought into the IPO - a disaster.Personally another thing that surprised is the ease with which companies were rolled out and raised money - you keep reading about 6 months and 12 months timeframes for follow-on capital-raisings and 18 months to IPO conferring ridiculous paper wealth on the founders. Good times. The world of venture capital is pretty opaque to me. This book is the best thing I've found so far about the courtship dance of the deal and the role VCs play in their portfolio companies. But, reading the book 10 years later, there's a lot of bubble-era absurdity too: the parade of vague ideas and barely-formed companies drawing bidding wars and hundred million dollar valuations is pretty unintentionally humorous in hindsight. Randall Stross provided a unique view about the early days of Benchmark Capital with lively portraits of its partners and their most famous investment ventures such as eBay and Webvan.Interesting and sometimes even hilarious to observe the venture scene of the late 1990s now, more than 15 years later. If you're interested in the subject of venture capital (or you're curious to hear how eBay got started) this is a GREAT read. The author also does a great job educating the reader on how VC works and what the jargon means. Probably a little dense for anyone who doesn't already have an interest in the topic. Only complaint was the foul language--too many F-words for a Mormon boy like me. 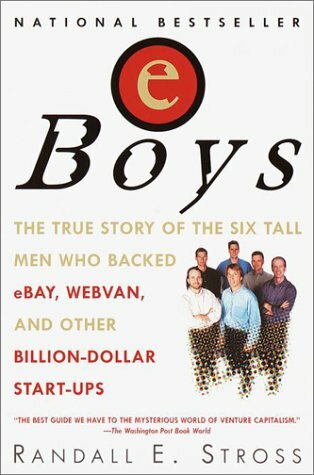 Part inside baseball look into the world venture capital, part history of of eBay and part first hand account of the dot-com bubble of the 1990s, eBoys still manages to weave everything into a compelling narrative. A great snippet of dot com history. At the time I found this an entertaining read. It was a good introduction to the world of venture capital, and the valley during the first internet boom. Great book that peeks into a famous VC firm in the pre-bubble era. Pretty interesting story following the guys from Benchmark through the dotcom boom. The jacket hypes them as the "guys who backed Ebay, Webvan..."Webvan. Interesting. A great book on the dot.com bubble before it burst! So exciting.